​Homeopaths Without Border’s mission is to introduce or advance the understanding and use of homeopathy in areas where it does not yet exist or is minimally available, as well as to promote and provide homeopathic care and healing in emergency situations. HWB is a non-profit, 501-c corporation. Homeopaths Without Borders is a volunteer-based, non-profit organization that believes everyone deserves access to high-quality healthcare. Our goal is to build and maintain partnerships across the Americas to help with medical emergencies and close the most significant health care gaps. We are accomplishing this by extending best practices in homeopathic care and education. Upon request, we provide information and resources so that communities may achieve their own sustainable solutions. Essential Curriculum for the Childbearing Year. HWB is proud to offer the Essential Curriculum for the Childbearing Year. This book which was developed by Lauren Fox, FNP-BC, CCH, is a practicum for birth attendants who wish to add homeopathy to their professional toolbox. Essential Curriculum for the Childbearing Year is the textbook being used for the new "Fundamentals of Homeopathy for the Childbearing Year" course now being taught in Haiti at the Hôpital Maternité de Carrefour​. AND the long awaited 2nd Edition of our popular textbook, Essential Curriculum for Learning Homeopathy, is also available at the HWB store. ​Both books are available in English and French. To learn more, click here. HWB's Executive Director, Holly Manoogian, CCH, and Clinical Director Lauren Fox, FNP-BC, CCH, are excited to be returning to Haiti next week where Lauren will be teaching the "Fundamentals of Homeopathy for the Childbearing Year" course with Teaching Assistant, Israel Joseph, NP, at Hôpital Maternité de Carrefour. Fifteen doctors, nurses, and community midwives will be the first class to use the Programme Essentiel pour L'Année de la Maternité, HWB's newest textbook. Holly and Lauren will be joined by veteran HWB volunteers Wendy Pollock, DC, CCH, Marina Braun, CCH, and Kimberlee Blyden-Taylor, ND. After the first week's session of the Birth Attendants program, which will include classes and clinics, HWB will again teach the Fundamentals of Homeopathy course to medical practitioners at the Association Médicale Haïtienne. Lauren, Holly and the team will be joined there by Teaching Assistants, Joseph B. Prosper, MD, and James Alcy, Pharmacist and Homéopathe Communautaire. Lauren reviews case analysis with a student. Drs. Prosper and Michelet demonstrate trituration of a substance during class. 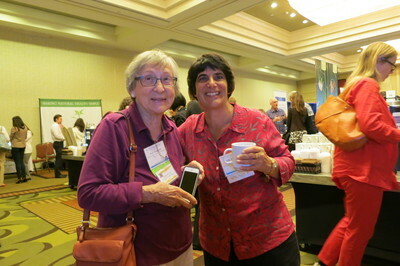 The 2018 Joint American Homeopathic Conference in Phoenix, AZ was a great success. Board member Liz Breadon, CCH, met with volunteers, past and present and shared the HWB story with participants. Board member, Ian Luekper, ND, presented a seminar on Palliative Care and Homeopathy. Once again, the Essential Curriculum for Learning Homeopathy, our textbook for teaching Homeopathy, was a great success. See you next year in Baltimore! Volunteers Sally Tamplin and Tanya Kell, RSHom (NA) share HWB experiences with HWB Board Member, Liz Breadon at the 2018 JAHC. Certificates Awarded to HWB's Newest Class! On March 28, twelve health professionals received their certificates at an award ceremony in Port Au Prince, Haiti. These students (8 physicians, 3 nurses and one social worker) completed the 90-hour course in the Fundamentals of Homeopathy. Students attended classes taught by Clinical Director, Lauren Fox, FNP-BC, CCH where they learned the art of homeopathic casetaking and the science of homeopathy. Additionally, during each session, these professionals participated in community clinics in hospitals in Port-au-Prince with HWB mentors. Students will continue to work in study groups to expand their knowledge and support each other in their homeopathic casework. We wish these new homeopaths, les félicitations! 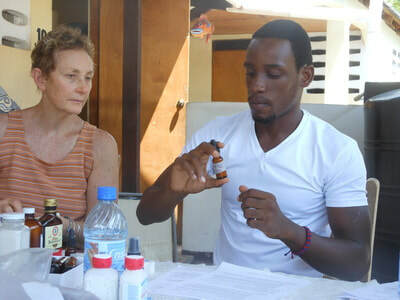 HWB volunteer Homeopaths headed to Haiti the week of March 21 to assist HWB's Clinical Director, Lauren Fox, FNP-BC, CCH, for the final session of the Fundamentals of Homeopathy course for Health Professionals. Volunteers Jeri Russell, RSHom (NA), Tanya Kell, RSHom (NA) and HWB board member, Suzanne Smith, CCH, mentored the students and worked closely with translators Kenny and Rosa as well as Homeopathes Communautaires, PG Legerme and James Alcy. 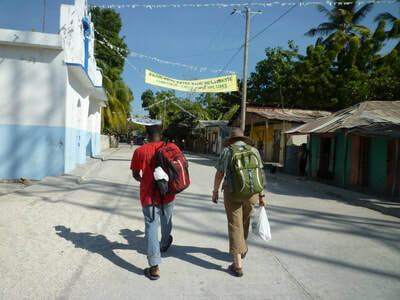 The HWB team landed in Haiti and classes began on January 20. Lauren Fox, FNP-BC, CCH, is teaching the third session of the health providers' course in the Fundamentals of Homeopathy. The HWB team serving as mentors to the students are: Wendy Pollock, DC, CCH, Marina Braun, CCH, RSHom. and Devra Krassner, ND. It is Devra's first service trip with HWB, and both Wendy and Marina are here with HWB for the fifth time! Partnerships make it happen. Thank you to all of our volunteers and supporters. HWB Team Returns to Haiti on January 18. Only a few days until the HWB team, led by Clinical Director, Lauren Fox, FNP-BC, CCH, returns to Haiti. The Fundamentals of Homeopathy for Health Professionals Course is well underway and students, translators, and mentors are eager to move forward. Community clinics are an integral part of the course, and HWB's experienced volunteer homeopaths will work hand in hand with students of the class. The team will be in Haiti from January 18-25. HWB thanks those organizations which have helped support growing affordable safe healthcare in Haiti through their scholarship donations to Homeopaths Without Borders. Israel Joseph, RN, working up an influenza case (left), is participating in the Fundamentals of Homeopathy for Health Professionals course through the generosity of the Maine Association of Homeopaths. Cherline LaGrerre, RN, working up a case using a chart from the Essential Curriculum for Learning Homeopathy textbook (right), is participating in the course through a scholarship from the Homeopathic Nurses Association. 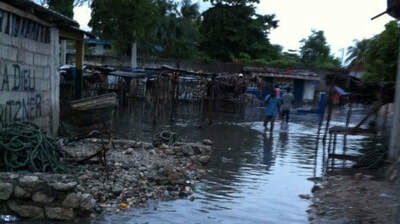 ​The HWB team has arrived in Haiti! Today classes resume in Port au Prince for Medical professionals. Clinical director and professor Lauren Fox FNP-BC, CCH is joined by Tanya Kell, RSHom (NA), CCH, Isabel Frankel, CCH, and Michael Cahn. Lauren is "Excited to be back in Haiti teaching the Fundamentals of Homeopathy to these dedicated doctors and nurses." This session of the course consists of two full days of classroom studies and three days woking in community clinics in the Port au Prince area. ​ Lauren Fox, FNP-BC, CCH, representing HWB, was the keynote speaker at the Association of Haitian Women's Annual Fundraising event in the Boston area. She spoke on "A Transformative Approach to reducing Maternal and Infant Mortality in Haiti." Lauren, as HWB's Clinical Director, has experience both in the northeast US and Haiti working with women and children. Attendees appreciated her down to earth style and the depth of knowledge she shared with them. THANKS Lauren and Thanks Isabel Frankel, CCH, and Liz Breadon, CCH, for local support. Photo below: Lauren with expert interpreter, Lunine Pierre Jérôme, translating the presentation into Creole. Photo right: Board member, Isabel Frankel, CCH, Lauren Fox FNP-BC and Carline Desire, Executive Director of AFAB (Association of Haitian Women-Boston chapter). This course was developed by Homeopaths Without Borders for teaching Homéopathes Communautaires and health care practitioners in Haiti. This book is now available in English and can be purchased here. It is suitable for study groups, schools and individuals wishing to learn the Fundamentals of Homeopathy. With many thanks to our generous supporters, the HWB team arrived in Haiti this week and has begun teaching a class of Haitian doctors and nurses from the newly published French edition of the Essential Curriculum for Learning Homeopathy. The class is being taught by our Clinic director, Lauren Fox, FNP-BC, CCH with assistance from Mhaidjiv Legerme who is also serving as translator. Students have each received a copy of the manual and are already practicing case taking and interview skills. Check our Facebook page for notes from the field. ​National Center for Homeopathy's Board President, Edward Conway, presented this year's Julian Winston NCH Service Award to Jean Hoagland, HWB Director Emerita. HWB's Executive Director, Holly Manoogian, accepted the award for Jean. In his remarks, Mr. Conway said, ​"Jean Hoagland served on the NCH board for more years than any of us can remember - 12 of them as treasurer and 4 as President. She is a lifetime member and supporter of NCH, and a frequent contributor to Homeopathy Today. Jean was also instrumental in forming NCH affiliated Study Groups including her own which she led for more than 20 years. That study group is still active today in Mt. Dora Florida. "One of Jean's great accomplishments while working with NCH, she helped organize and guide Homeopaths without Borders and encouraged a long-standing partnership and relationship between these two organizations. "Jean demonstrated a life-long love of and use of homeopathy for herself and her family. She promoted the use of homeopathy by those with whom she came in contact. The huge amount of volunteer time given by Jean was served in a number of important organizations. When I first joined the board, Jean was serving as Treasure. I’ll never forget her keen eye and commitment to the details of NCH finances. We went through some tough years together in trying to balance budgets and keep NCH on track. She was a great mentor to younger boarder members and though she was an incredibly serious and devoted contributor, she also always found time for a good joke and playful smile. I’m honored and proud to give this award to Jean Hoagland." 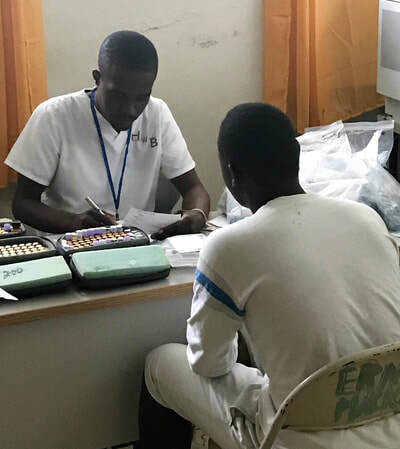 During our most recent service trip to Haiti in January, mobile clinics throughout the Haitian countryside were a collaboration between the North American HWB team, Dr. Joseph Prosper and his clinicians, and Homéopathes Communautaires. AND we couldn't have done it without the generosity of Hahnemann Labs, Washington Homeopathic Products, Hyland's Homeopathics and Boiron USA. January 19, 2017 Returning to Haiti! ​HWB is returning to Haiti this week! Holly Manoogian, CCH, and Clinic Director, Lauren Fox, FANP-BC, CCH, will be joined by first-time volunteer, Shahin Afman from Ohio. They will join Dr. Joey Prosper and after a couple of days in Port au Prince hope to head into the countryside town of Dubriel to work with Homéopathes Communautaires in clinic there. After 2 months away, it will be beneficial for the Haiti and US teams to be working together again. On October 6, 2016, Hurricane Matthew, the first Category 4 storm to make landfall in Haiti in 52 years, wrought destruction on this island nation. As HWB Executive Director, Holly Manoogian, CCH, kept close track of weather and conditions in Haiti, she was in regular contact with our colleagues in Haiti. They asked us to send teams as soon as the extent of damage was known. When it was safe to travel, our first team left for Haiti on October 14. Click here to read all about HWB's four weeks in Haiti providing health care to areas hardest hit by Matthew. Belle Anse October 6, 2016. Photo by CARE. Students of HWB courses are taught how remedies are made. HWB partners with medical professionals and Homéopathes Communautaires in Haiti. Make your Amazon purchase count...When you shop, at Amazon via http://smile.amazon.com Amazon will donate to Homeopaths Without Borders. Sign up today and specify that you want your donation to go to HWB. And thanks!!! It is with heavy hearts that we share the news that Joe Lillard, the President Emeritus of the HWB Board, owner of Washington Homeopathic Pharmacy and longtime supporter of homeopathy died on May 27, 2016. The HWB team will always remember his love of homeopathy, his sense of humor, his banjo playing and his dedication to HWB and all things homeopathy. Read full obituary from NCH website. May 17, 2016 -- Holly Manoogian and HWB Clinical Director Lauren Fox are on their way to Haiti. For the first time, the team will be traveling to Mombin Crochu where Lauren and Israel Joseph, the nurse who works in the hospital there, will be working together in the hospital. They will also give a presentation to nurses interested in the next Homeopathy for Birth Attendants class. May 14, 2016 -- Tonight HWB was awarded a certificate in appreciation of our support and collaboration with Haitian American Nurses Association (HANA) of Tampa, FL at their 1st annual Scholarship Fundraising and Awards Gala. Board Vice-president, Laurie Stemm attended the gala and accepted the certificate on behalf of HWB. She said, "HANA's motto, "Here to Serve, Promote and Educate" aligns with HWB's motto, "Teach, Treat, Together." Thank you HANA. On March 20, HWB Board Member, Liz Breadon, CCH, hosted an Irish - Haitian tea fundraiser with a few of her friends in the Boston area. Attendees enjoyed Haitian meat pies and an array of Irish delectables. HWB Executive Director spoke about our work in Haiti and guitarist Yvon Lamour provided entertainment. The event raised over $2,000 for education efforts in Haiti. If you're interested in joining us in Haiti in 2018-2019, click here.